In 1965, the M-65 field jacket was first introduced to US troops and since then it has become a fashion statement for outdoor lovers and military personnel. The field jacket is extremely handy and it is not only durable in every sense of the word, but also very versatile and adaptable to almost any weather condition you might find yourself in. Our search for the best field jackets took us to many places and shared many of the secrets these jackets have. We have decided to share this information with you and help you choose the ideal field jacket for your outdoor endeavor. Filed jackets have many uses and they have now also become part of the regular daily wardrobe, but we would specifically like to focus on the value it brings to the table in terms of outdoor use. Before we can share these magnificent jackets with you, we have decided to add a buyer’s guide that will show you exactly how to choose one for yourself. The criterion used in this buyer’s guide is the same we used when we set out to rate and judge each of these jackets. Construction: First, you will need to look at the materials and the construction of the field jacket. Since we are focusing on outdoor field jackets, the materials should be a little more durable. You could rather give up some style for endurance to ensure that the jacket does not rip or tear when faced with the elements of nature. Comfort: The comfort aspect of a field jacket will directly correlate with the fit and the design. In outdoor conditions, comfort can make a huge difference and will certainly spoil your trip if is not there. We recommend sizing up the jacket to ensure that you get the perfect fit without any additional hassles. Element resistance: The top field jackets should be able to withstand all of the weather conditions. Now, we do not recommend running through a fire, but it should keep your torso and head dry when the rain unexpectedly starts up. The inclusion of a hood will also ensure that your head is protected from the wind and the elements of nature. Storage space: While you might be carrying a backpack along, having multiple pockets will be great for keeping your valuables protected. The pockets should be durables and waterproof to keep the water out and also to keep your hands warm if needed. Adjustability: IF you have ever spent significant time outdoors, you will have noticed how suddenly the weather can change and often times, you might even experience 4 seasons in one day. The best field jackets are adjustable and will allow you to open them up easily for better ventilation, but they will also provide you with enough insulation when the weather is cooler. For outdoor use, these 5 features stand out as the top of the range and once you have ensured that these are all incorporated in the jacket, you will be able to wear it in all weather conditions without any hassles and also resist the elements. We would also like to mention that field jacket features can now be found in many other jackets as well and this will be good for having multifunctional use. If you manage to find one of these, you will have that timeless look that will be great in all conditions. The Brandit men’s M-65 Giant Olive field jacket takes you back to the start of the M-65 jacket and it offers a lot of versatility and durability. The jacket is the ideal winter’s jacket and it has been constructed from 100% cotton materials. The lining material is polyester and this will only improve the comfort and keep you more insulated in the cold weather. This high collar design features a Velcro closure with a full-length zipper when the weather does get really cold. The added storm flap is 100% waterproof and will allow you to keep your valuables safe in the multiple pockets the jacket has. To tighten up the fit, you will have a drawstring at the bottom and should you find yourself in the colder areas of the Great White North, you will be able to adjust the fit and have more comfort at the same time. The rain does not bother you in any way and in addition to the storm flap, the jacket also has a hidden hood to not only keep the rain and water out but to also keep your ears and head warm and insulated from the cold weather. 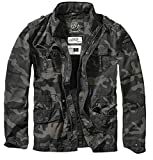 In terms of pricing, this jacket is actually not badly priced and since it takes the identity of the original M-65 military jackets, we would definitely recommend this to any outdoor enthusiast. The color is not the most attractive and hunting in the snow will not be ideal, but your cold outdoor adventure will be much more fun with the Brandit men’s M-65 Olive field jacket. To fit chest (recommended): S 34"-37", M 36"-39", L 38"-41", XL 41"-44", XXL 44"-48", 3XL 48"-52", 4XL 50"-54", 5XL 52"-56"
The Brandit Britannia Dark Camo Jacket is much similar to the previous Brandit jacket, but it does feature a smaller and more stylish design. The jacket is quite similar in terms of materials and they also share the same level of durability, but this jacket will certainly be the best choice for everyday use in the city. The jacket is also delicately designed and has been tested to be waterproof. The fit is also exquisite and with the multiple options you have to choose from, chances are that you will easily find the right fit for your body and structure. Another amazing feature we were drawn to, which does give it a little edge over the first one, is the ability to choose different colors. Depending on your location and the outdoor adventure you are planning, you will be able to get the ideal color. This will also be very beneficial for hunters and their camo outfits. Finally, compared to the previous jacket, this one is also very lightweight and will be easy to walk with on your next hiking or backpacking trip. The jacket also provides great insulation, but this can be turned into ventilation once the jacket is opened up. The pricing is not too bad either and it is one of the more affordable high-quality outdoor jackets you will find. We highly recommend this jacket for the multi-functionality it provides and the ability to wear it anywhere with any wardrobe. Orvis has been widely regarded as one of the top field jackets and jacket brands and the Heritage Field coat exemplifies their quality and attention they have put in their clothing. The dry waxed cotton has been widely known for its moisture-wicking properties and it will help top repel rain that you might encounter and keep you dry on the inside. When closed with the full zipper, this jacket will provide you with optimal insulation and keep you warm in some of the coldest of temperatures. Once you see the sun reappear, the jackets will provide you with good ventilation. The underarm panels will allow the wind to seep through and the buttoned wind flap will be ideal when it comes to promoting ventilation. In terms of storage, you will have more than enough pockets to store your smaller items. On the inside of the jacket, you will also have 2 pockets to store valuables and they will be protected from the elements. The sizing on this jacket is quite accurate and very true and you will fit perfectly if you just purchase the right size. This jacket is fairly expensive, but it is stylish and durable as well. We highly recommend the jacket for the multifunctional use it provides and the added versatility. Whether you love the outdoors or only get out occasionally, this jacket will be a great option for you. Known as the world leader in field jackets, Alpha industries was the first brand to produce this highly sought out jacket and their products and reputation managed to stand the test of time. The men’s M-65 field coat is the first ever field jacket to be used by the US troops in 1965 and now it available to us citizens as well. The coat is designed from nylon and cotton materials and it has been specifically designed to keep the soldiers protected from the elements. The inner lining on the jacket is phenomenal and you will certainly be enjoying the insulation it provides during those colder winters. While mobile phones and technology might not have been prominent features in the 1960s, soldiers still needed to keep their cigarettes from getting wet in the forests of Vietnam and this led to the manufacturers designing water-resistant pockets to keep everything dry. Today this can be used to keep your mobile devices dry and secure from the elements. While this coat might seem expensive, it is once again worth noting that it managed to stand the test of time and also features a fashionable timeless design used in many other jackets today. If you plan on venturing outdoors, this field jacket will be great for all purposes and will keep you safe in every weather condition. The Vintage field jacket incorporated the designs used in the M-65 field jackets, but it will add its own flavor and style to make it a great jacket for everyday use. The jacket is designed from military grade materials and certainly will not disappoint when it comes to keeping you warm and protected against the elements on your outdoor adventure. With two string chords at the bottom, this field jacket can be fully tightened and after it has been tightened, the combination of the fit and the inner lining will ensure that you have optimal insulation from colder temperatures. In terms of storage space, you will not have a lack or a shortage and with the multiple pockets, you will be able to store your entire set of valuables without having to worry about them getting wet. The outer materials have been treated with water repellent properties and the jacket will keep everything dry in the biggest of storms. Compared to many other top field jackets, the Vintage field jacket certainly fits right in the middle when it comes to pricing and this will make it a great buy. This jacket does excel in style and can be worn throughout the day with any wardrobe, which will give you value for your money and multifunctional use. We highly recommend this jacket to every male on the planet. The Filson men’s Tin cloth field jacket is one of the more high-end field jackets on the market today and it is also very expensive. The jacket certainly excels when it comes to quality and value and will provide you with the timeless field jacket look, as well as the durability required to take on nature and its elements. The cotton and nylon materials on this jacket have been treated with moisture wicking properties and this will allow the entire jacket to be waterproof and keep you dry. When a major storm is inbound, you can simply pull out the storm flap and this will increase the ability of the jacket to weather off any storm nature has cooked up. The jacket has no shortage of pockets, but it does add unique hand warmer pockets on either side and this has been lined with wool. These wool pockets are ideal for keeping your hands warm in the colder weather and it will add to the insulation provided by this already warm filed jacket. This jacket is ideal for hunting and any outdoor adventure, but it is also very expensive and you will need to buy the liner separately. We still recommend this jacket to anyone capable of affording it, but if you cannot, you need not feel bad, as there are many other jackets with similar features for much cheaper. The Ultra Force Olive Drab M-65 field jacket is a great cheaper alternative that will still keep you warm in cold temperatures. The jacket has been predominantly constructed from polyester and this will certainly help to keep out the rain and keep you dry on the inside. The jacket features cotton and polyester twill on the inside and this has been incorporated for comfort. In colder condition, the cotton will keep you insulated, while the polyester keeps the moisture out. The polyester also allows the jacket to dry very fast once it does come into contact with water. Similar to other field jackets, this one also features multiple pockets for you to store all your valuables. The jacket also features a concealed hood that is easily accessible and the string cords will allow you to tighten up the fit. Since the jacket is lightweight it will be ideal for all conditions, but we have found that it does lack a little in terms of good ventilation and the inner cotton will keep the wind out when the zipper is closed. 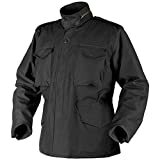 The polyester material certainly helps to keep the price down and since it is extremely waterproof, we have selected this field jacket as our best choice jacket for area high in moisture. The field jacket might not be ideal for tropical temperatures, but once you start moving the poles and snowy areas, the jacket will be perfect. The Helikon Genuine M65 Jacket is definitely a jack of all trades M-65 field jacket and it features a combination of the most commonly used materials to keep you insulated and provides you with decent ventilation when needed. The jacket is also designed with a high collar and this will keep the cold wind from peering through the top to get inside. Once again drawstrings have been added to allow for a tighter fit and the multiple pockets will ensure that you do have enough space to store all your valuables. This jacket is also ideal for areas high in moisture and will keep you dry. The added hood will prevent heat from escaping through your head and you will be able to sleep in this jacket whilst backpacking. The inner liner can also be removed and this will give you the opportunity to machine wash the jacket without any damage being done to the liner. The polyester will allow the jacket to dry faster and we recommend that you drip dry the jacket to prevent any heat damage from the tumble drier. The jacket is actually not that expensive and it is certainly one of the best cheaper alternatives to the original M-65 field jacket that you will find. We highly recommend this jacket as our second budget buy and for people looking to wear the jacket throughout the day with their casual wardrobe. To fit chest (recommended): S 32"-36", M 35"-39", L 38"-42", XL 41"-45", XXL 44"-48", 3XL 47"-51"
5.11 have been designing military grade combat boots for multiple years and they certainly do have a lot of experience when it comes to military and outdoor-styled clothing. 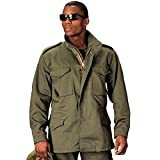 The Taclite M-65 jacket is much similar to the original military grade field jacket used in Vietnam, but it does not feature as much cotton in the construction. This jacket is one of the more stylish options you could have and it is also very flexible when it is worn. The jacket is definitely oversized and we definitely recommend that you consider wearing one size smaller for the ideal tight fit to keep you a little more insulated on your outdoor adventure. The functional epaulets add more style to the jacket and the multiple storage pockets will allow you to keep all the valuables close by. The inner pocket is quite large compared to many other jackets and it will allow you to store documents and multiple electronic devices safely away from the elements. This jacket is fairly priced for what it offers, but it is not the cheapest you will find. In terms of style, we highly recommend this field jacket and we believe that you get multiple years of use from it. The North Face Talum field Jacket is probably the best-insulated field jacket on the list and the 500 fill down incorporated into the design will keep you insulated in the coldest of temperatures. Since down is not the most water resistant, the outer lining has been treated with Water repellent properties and this will keep the water from getting into your jacket. The jacket features a standard high collar to keep you insulated and to allow some ventilation, you will also be able to use the wind flap to let some of the wind inside. The design is extremely stylish and you will have multiple storage pockets to keep your valuables safe from the elements as well. In terms of water resistance, the jacket is only capable of resisting water to a certain extent and should this be surpassed, the down will fall flat. The jacket can also be machine washed and tumble dried, but it does take a little longer to dry out completely. We highly recommend this jacket for the cold temperature regions of the world and since the jacket does use the same concept as a sleeping bag and will keep you insulated while enjoying the outdoors this coming winter. The Timberland men’s waxed canvas 3-in-1 field coat is the perfect multifunctional addition to your set of winter clothing. The jacket does provide you with options when it comes to wearing it and you will be able to have a cooler wear, the hooded wear or the fully insulated wear, which means that you will have three jackets for the price of one. The entire jacket is designed from dry waxed cotton and this has been made to repel water and keep you dry throughout the year. Once the jacket has been stripped down of it warmer features, you will be able to get optimal ventilation to keep you cooler. This jacket is quite expensive, but with the multiple pockets and the multifunctional use, we highly recommend it to anyone looking for the perfect all season jacket. The jacket is great for the outdoor and it certainly is very versatile. The North Face men’s Kassler field jacket features a durable outer shell that will keep you warm and dry in the coldest of temperatures. The jacket has been constructed from nylon and polyester and with no cotton, it certainly does lack a little in terms of comfort and insulation. The jacket is also fully adjustable and you will be able to take off the hood or keep it on and the added wind flap can be opened for more ventilation as well. The zipper will keep you full enclosed and to add top the ideal fit, you will be able to pull the chords to keep have a better fit. The jacket is also oversized and we do recommend looking for one size smaller to get the best value for your money and a true fit. This field jacket is quite expensive and we highly recommend it for the style it portrays and the value you will get for your money. This will be the ideal jacket to wear for every situation and to keep you comfortable throughout the year. Choosing the best field jacket is not easy and all of these brands certainly excel in what they bring to the table, but considering the first real field jacket is still made today, we cannot choose any other brand but the Alpha Industries Men’s M-65 Field Coat. This coat is a little expensive, but if you are looking for value and a trusted reputation, Alpha Industries will provide you with it. We would like to thank you for reading this article and we do hope that you have managed to find the ideal field jacket for your needs. We would like you to share your thoughts in the comment section and let us know if we might have missed any of your favorites and how they work for you.